Just how much does Brandman ask for tuition today, and how much is tuition forecasted to change? How does tuition compare to the average? Keep reading to find out. Find out how fees and tuition at Brandman University measure up to other U.S. colleges and universities and discover how to successfully plan for probable price increases. How Does Brandman University Measure Up To Other Schools? For nationwide, regional and statewide comparisons, look at the table below to see how Brandman measures up to other schools. In the 2017 - 2018 school year, regular undergrads at Brandman were charged $12,360, prior to adjustments for financial need. $12,000 was the price tag on tuition. The remaining $360 represents additional fees. Unlike public colleges, Brandman does not provide a tuition discount to students who live in state. Brandman University tuition and fees is the sum charged to students for one academic year, and does not include room and board. However, many students wind up having to pay under full tuition after receiving financial aid and other discounts. How much does Brandman cost part time? 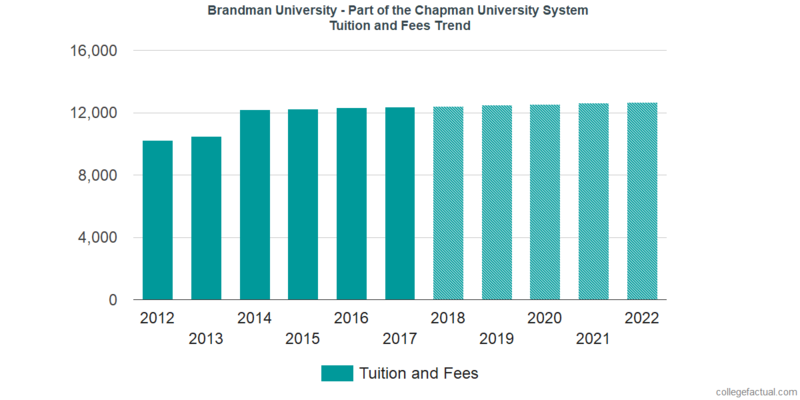 Brandman University tuition and fees have remained steady in the last five years. We estimate the expense of tuition and fees this year will total $12,421. If costs remain constant, two years at this school will run you $24,902 and four years will run you $50,049. On top of that, you will probably have extra costs such as room and board, books and, transportation. The following chart shows predicted future tuition and fees for undergraduate students at Brandman. At many schools you'll end up spending more for your last year of college than you will in your first. This is because of annual price increases. It pays to be aware!